A project has been selected for a new lift and stairway to the top of Mojácar village. 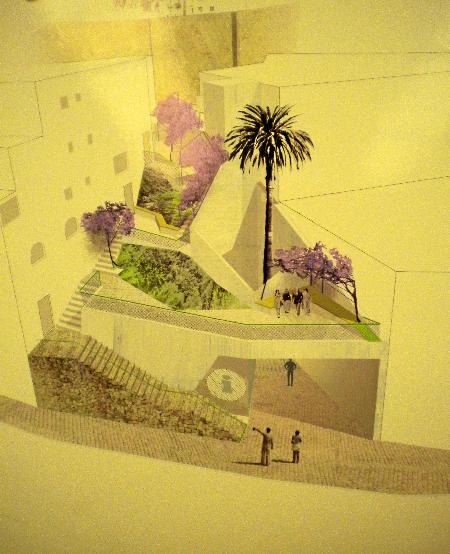 Called the “Escalera de color” (Stairway of colour), it will be executed on the current Muralla de Roque street, and consists of a new walkway, split into several sections, with nice gardens.The new garden involves redevoping an empty plot of land owned by the townhall, which currently has some electric posts in it (the plan also involves hiding those wires). At the back of the gardens (one assumes a tunnel of some sort is involved) will be a lift to carry the more portly amongst us to the top of the village. Don’t get too excisted: The project has been selected by the Mayor and the Diputación, and a plan will now be drawn up to see how much this is going to cost, and if money is available. Remember, just because people are talking about it doesn’t mean the bulldozers start next week! This entry was posted in Blog and tagged lift, mojacar by David. Bookmark the permalink. I am told that The “Escalera de color” is not costing the Town Hall or people of Mojacar a penny, as it is the brain child of a “Promotor” and a fee will be charged to travel goes to the promoter and that work is planned in the last 3 months of the year.